I’ve recently encountered a number of blog posts, often written by individual distributors working for larger essential oil companies, which spread two myths about essential oils I find particularly dangerous. The first myth is that pure and unadulterated essential oils don't expire and can last for centuries. 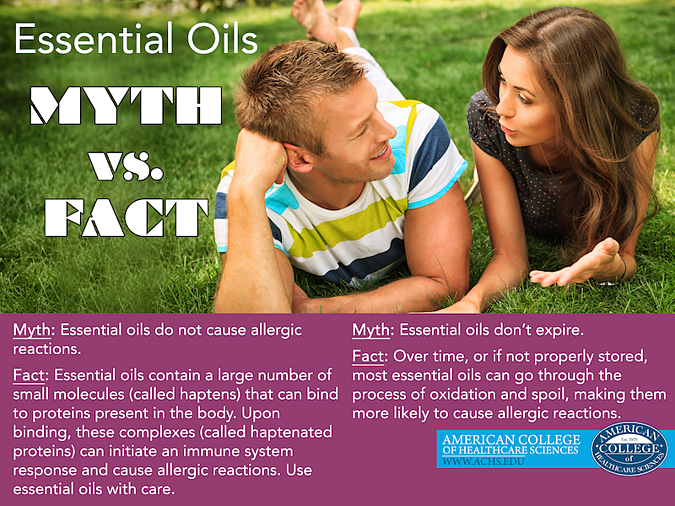 The second myth is that unadulterated essential oils do not cause allergic reactions. Both of these beliefs can have damaging consequences and can be debunked with a deeper understanding of the properties of essential oils and their constituents. This first myth claims that essential oils can last indefinitely without degradation. This claim appears to be based on the articles about the composition of mummy embalming fluids (preservatives) published in the journal Nature in 2001 and 2004. While these and follow-up studies revealed that fragrant plant materials were used in the embalming process, they do not remotely suggest that essential oils do not degrade or oxidize. Resins of coniferous trees and myrrh, not pure essential oils, were used as embalming materials. A few diterpenoid acids (these compounds are present in resins and are not found in essential oils) and numerous products of their degradation were identified upon detailed chemical analysis of the materials. Additionally, simple chemistry can show us why and how essential oils degrade with time. Essential oils are complex mixtures. Their medicinal benefits come from active constituents like monoterpenes, sesquiterpenes, monoterpenoids, and sesquiterpenoids. These are compounds consisting of 10 (mono-) or 15 (sesqui-) carbon atoms that may also have an oxygen atom attached to them in the form of alcohol, aldehyde, acid, or ketone group (-oid). They also always contain a few carbon—carbon double bonds—unstable bonds that are characteristic for unsaturated fatty acids. When monoterpenoids and sesquiterpenoids are exposed to air, they tend to undergo the following oxidation process: alcohol is transformed to aldehyde, aldehyde may turn into acid. Sound familiar? This is the same process responsible for spoiling wine and turning it to vinegar when it is accidentally exposed to air during storage. Some monoterpenoids, such as geraniol (which is also an alcohol found in essential oils like geranium Pelargonium graveolens (L'Her.) and grapefruit Citrus paradisi (Macfad.)) are more prone to oxidation. Others, such as linalool (found in essential oils like immortelle Helichrysum italicum (Roth) and lavender Lavandula angustifolia (Mill. )), are more stable. In addition, carbon-carbon double bonds can also open into single bonds and grab oxygen atoms forming oxides, epoxides, and peroxides. Have you ever had a bottle of unsaturated vegetable oil go rancid in your cupboard? Did you notice the “off” odor of the oil? It’s the same chemical process. Since nearly all essential oil constituents are unsaturated compounds containing carbon, essential oils can undergo this same reaction and spoil or oxidize. While in the case of essential oils, this process does not usually produce the unpleasant odor (though oxidized citrus and other essential oils rich with limonene develop a rather unpleasant smell), and oxidized essential oils should be avoided. With the rare exception of patchouli Pogostemon cablin (Blanco), sandalwood Santalum spp., and vetiver Chrysopogon zizanioides (L.), oxidation spoils essential oils and degrades their aromatic quality and therapeutic properties. In addition, it leads to the formation of skin irritants and potent allergens. Exposure to spoiled essential oils may cause skin rashes and more serious allergic reactions, which I discuss below. Drastic change in the aroma and consistency (thickening or clouding) of essential oil are good indicators that your oil has oxidized and spoiled. 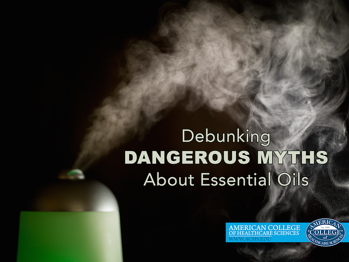 Another myth circulating the Web is that essential oils do not cause allergic reactions. A fact often used to support this myth is that essential oils do not contain proteins. It is true that essential oils do not contain large molecules such as proteins and amino acids, which typically trigger allergic/immune system responses. However, essential oils contain a large number of small molecules (called haptens) that can bind to proteins present in the body. Upon binding, these complexes (called haptenated proteins) will initiate an immune system response and cause allergic reactions. An example of how exposure to haptens can cause an immune response is the well-known allergic reaction to poison ivy caused by the hapten urushiol. Penicillin is another example of a hapten that can cause anaphylaxis. Even some elements, such as nickel, act as haptens and can trigger an immune response when they bind to proteins. While allergic reactions to essential oils are somewhat rare, there are well-documented reports of these reactions, including some on commonly used essential oils, such as tea tree Australia Melaleuca alternifolia (Cheel), and lavender L. angustifolia. Another study suggested that 35 different essential oils, including bergamot Citrus aurantium (L.) var. bergamia, chamomile German Matricaria recutita (L.), geranium P. graveolens, and ylang ylang Cananga odorata (Lam.) var. genuina, may trigger allergic reactions. This is why it’s recommended to do a skin patch test prior to the use of a new essential oil to rule out the possibility of an allergic reaction. The importance of skin patch testing is stressed by the National Association of Holistic Aromatherapy (NAHA) and is also mentioned in the nursing textbook, Foundations of Nursing. Circling back to the myth we debunked earlier, there is also a connection between the oxidation of essential oil constituents and their ability to trigger allergic reactions. For example, it was shown that geranial—a product of the oxidation of geraniol (found in geranium P. graveolens essential oil)—is much more likely to cause an allergic reaction than the parent compound. In the case of tea tree Australia M. alternifolia essential oil, epoxides forming upon exposure to the air were identified as allergens. Not surprisingly, allergic reactions to stored/oxidized tea tree Australia M. alternifolia essential oil were stronger than reactions to the fresh oil. Similarly, when lavender L. angustifolia essential oil is exposed to air, linalyl acetate is oxidized to hyperoxides and epoxides that are potent allergens. To put it simply, spoiled (oxidized) essential oils have a greater risk of triggering an allergic reaction. Oxidation requires oxygen, so it’s important to store your essential oils in a cool, dark place (away from light sources) with a tightly closed lid. Oxidation occurs much faster at higher temperatures and upon exposure to light. Shelf life varies for different essential oils, with citrus essential oils being more prone to oxidation (nine to 12 months of shelf life), so I recommend keeping those oils in the fridge. Essential oils are incredible plant compounds when used safely and properly. If you have any questions about the chemistry or information in this article, please let me know in the comments. Bhattacharya, S. (2010). The facts about penicillin allergy: a review. J Adv Pharm Technol Res., 1(1):11–17. White, L., Duncan, G., & Baumle, W. (2011). Foundations of Nursing. Clifton Park, N.Y.: Delmar/Cengage Learning, 252.